2010 Stand Up Award Recipient Stephen Lucas — Rock Ethics Institute | Meet the Challenge. Stand Up. Make a Difference. As photos from the party started to circulate and voices of concern grew increasingly audible, Stephen Lucas knew that he should be the one to stand up and assume responsibility for the situation. It wasn't his fault that a white student had attended the Rainbow Roundtable Halloween party in blackface. He hadn't even been aware of the situation as it was happening. Still, his responsibility stemmed from the fact that, as President of the Rainbow Roundtable, he had dedicated himself to a leadership role in the often-marginalized LBGTQA (Lesbian, Gay, Bisexual, Transgendered, Queer, and Allied) community. Seen from the perspective of Stephen's commitment to advocating for under-represented groups, the student's choice of costume was not simply in bad taste; it invoked the ugly specter of a period in our history when whites commonly used blackface as one of a host of tools for dehumanizing and marginalizing black communities. Although it was clearly not the intention of the student to do this, the incident served to remind Stephen that LGBTQA communities need to be just as reflective as any other about the role that white privilege and historically racist attitudes might play in shaping their practices. If Stephen's ethical leadership shone through in his decision to confront this difficult situation head on, it became even more apparent in the particular way that he chose to respond. Instead of simply trying to clear his organization's name, he tried to clear the air. With the help of faculty, Stephen organized a movie presentation and open forum discussion aimed at educating fellow students about the history of blackface and encouraging students of all races to reflect on the ethical implications of how we choose to deal with this history. Stephen Lucas stood up, quite literally, in front of a crowd of mentors and peers and did what no leader ever looks forward to doing. He admitted that he did not have the answers to the questions people were right to be asking. At the same time, however, he refused to accept this as an excuse to ignore those difficult questions--questions that he thought could, possibly, lead us toward a constructive, community-wide dialogue about race. This is only one of many examples of the ethical leadership that Stephen has consistently demonstrated during his time at Penn State. 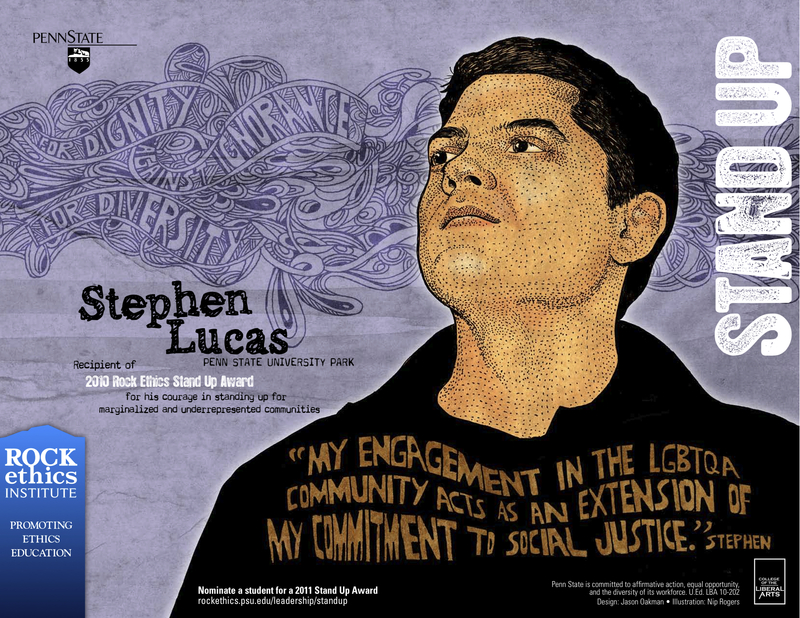 From his work on the Diversity Affairs and Student Life Committee for Penn State's undergraduate student government, to his work with the LGBTA Student Resource Center, and his involvement in establishing the Big Ten LGBTQA Alliance, Steve has shown the ability and the willingness to put himself out there and to stand up for social justice, gender equity, and human rights. After graduation, he plans to pursue further studies in public health, where he can combine his interest in policy work with his desire to continue advocating for individuals and communities that are traditionally ignored, marginalized, or stigmatized. What are you and your friends doing to Meet the Challenge and Stand Up? If someone you know is doing work similar to Stephen's, Speak Up and let us know about it so we can share his or her story. If that person is also a Penn State student, considering nominating him or her for the 2011 Stand Up Award.